The surface stitches are completed on this yoke, the last part of the embroidery is to work the outlines in double running stitch, I thought I had worked with back stitch, but found that they were actually double running stitch. 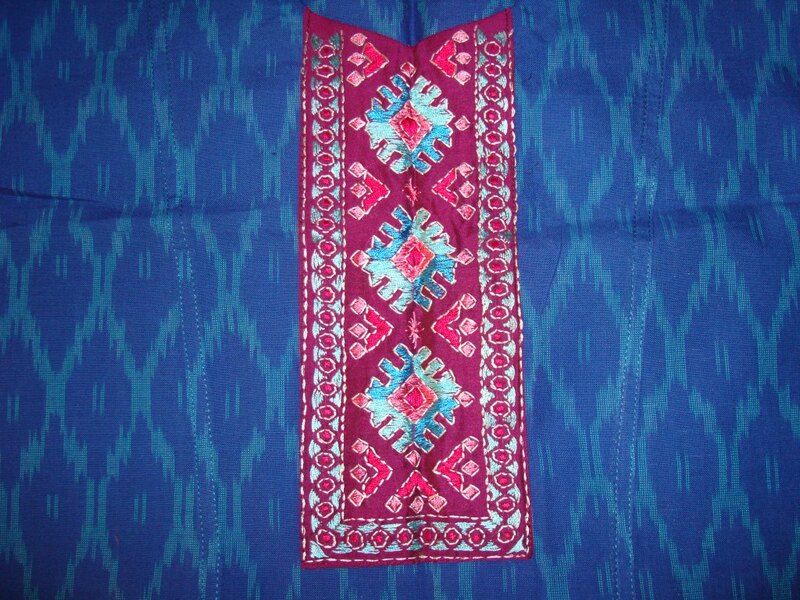 Though the design was Mexican, I was working phulkari embroidery on it. The yoke was placed over the tunic fabric to see the effect, another photo disaster. The yoke and the tunic fabric was given for sewing, on which the tailor did a good job. Close up picture of the same. The length of this tunic is such that , it can be worn with trousers or leggings. 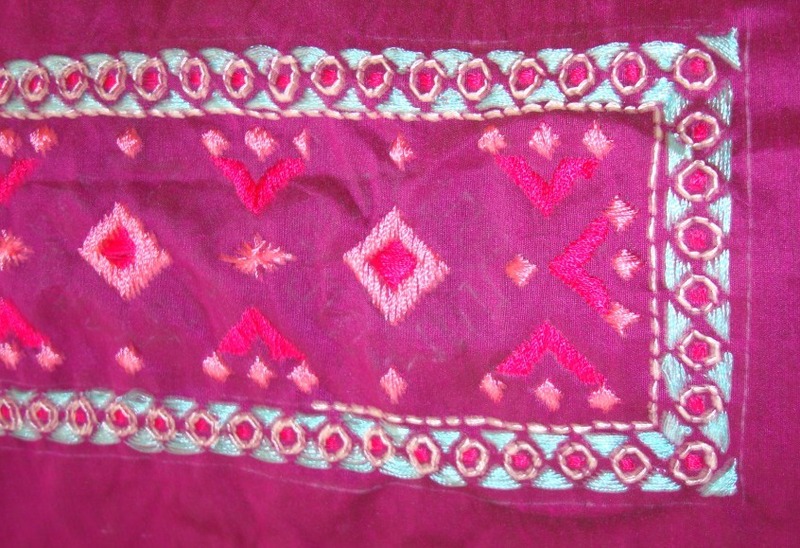 I am happy of choosing this dark pink fabric for yoke, it worked well for this tunic. The embroidery in this yoke is done in surface satin stitch. The outlining is done in back stitch. 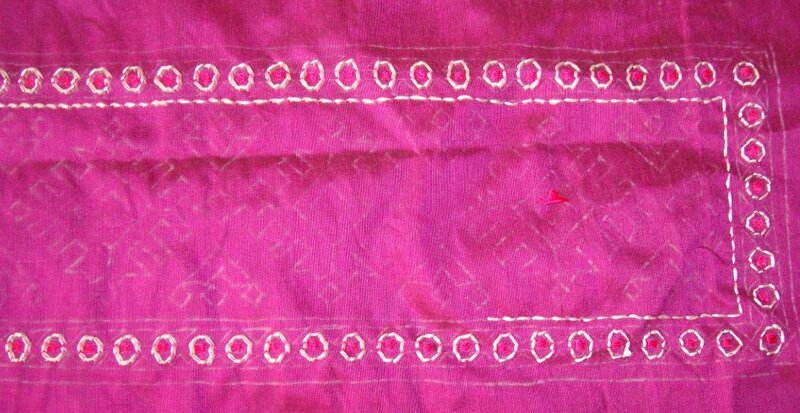 The next colour silk thread was light pink. The dark pink thread which was used earlier was not very visible on this piece, to complete the colour co-ordination, I used this colour. the centre motif was influenced by ethnic Mexican design, I used medium and light blue for this motif, which are the colours on the tunic. This picture did not come out very well, I realized only after it was transferred, couldn’t take another one because, I had passed on to the next stage of the embroidery. 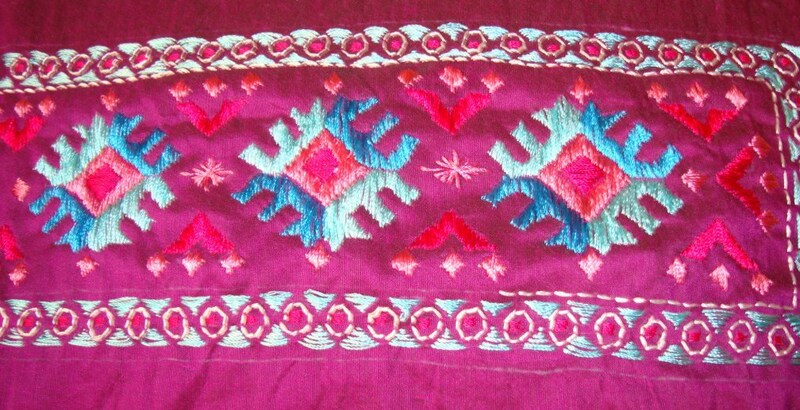 The last filling stitch was in medium blue colour. The completed yoke, will be posted tomorrow. 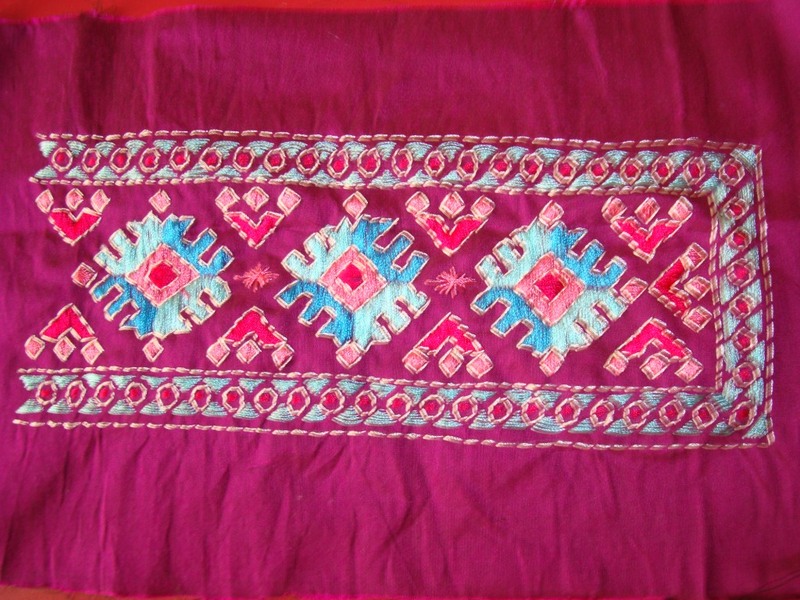 The small squares done in dark pink thread were outlined with white thread. 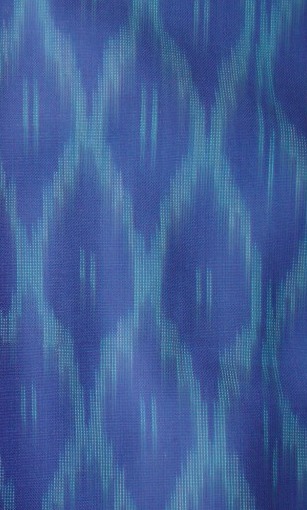 The next colour on the border is light blue, which is the same blue colour on the tunic fabric. the dark pink colour is also used for filling the shapes in the centre. I used silk threads for this embroidery, the white colour thread is cotton skein. Further details on my next post. 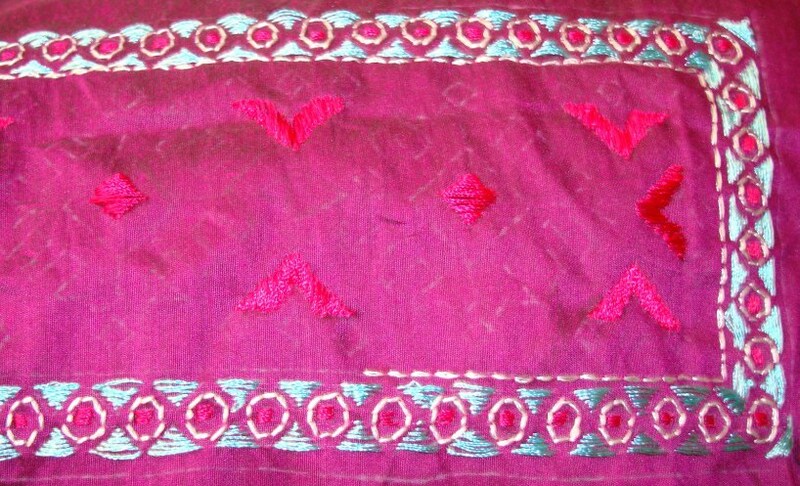 The yoke fabric was in dark pink. 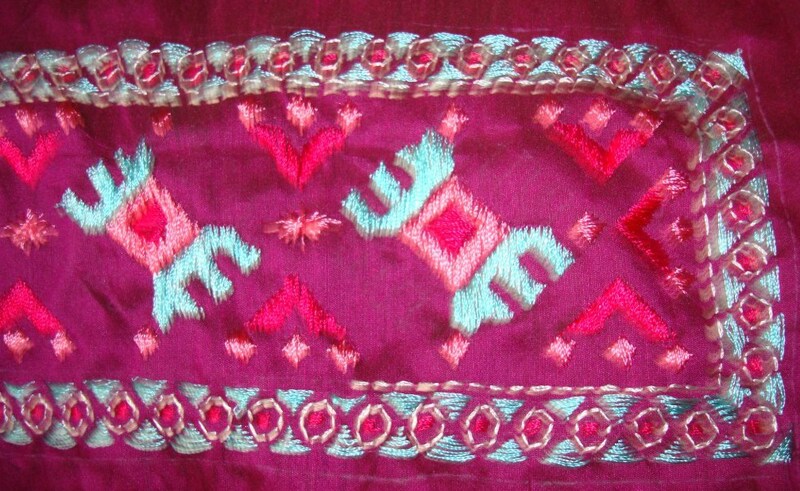 An Mexican,[ or early Indian] pattern was chosen for embroidery. Then this was drawn to suit my requirements. With the yoke fabric being dark, I did not use bold colours for embroidery. The first thread colour was dark pink, this shape will be outlined later with cream colour thread. 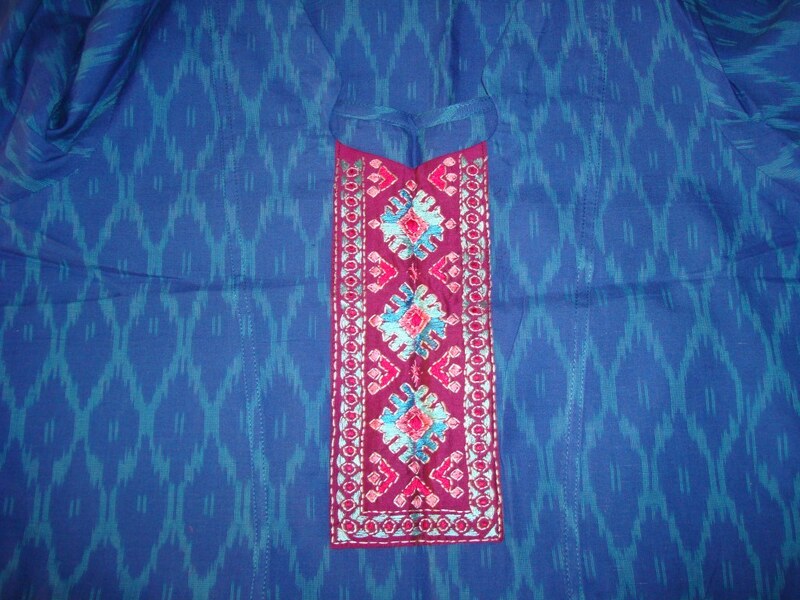 The filling of shapes were done with surface satin stitches[ or phulkari as in ethnic Indian embroidery]. 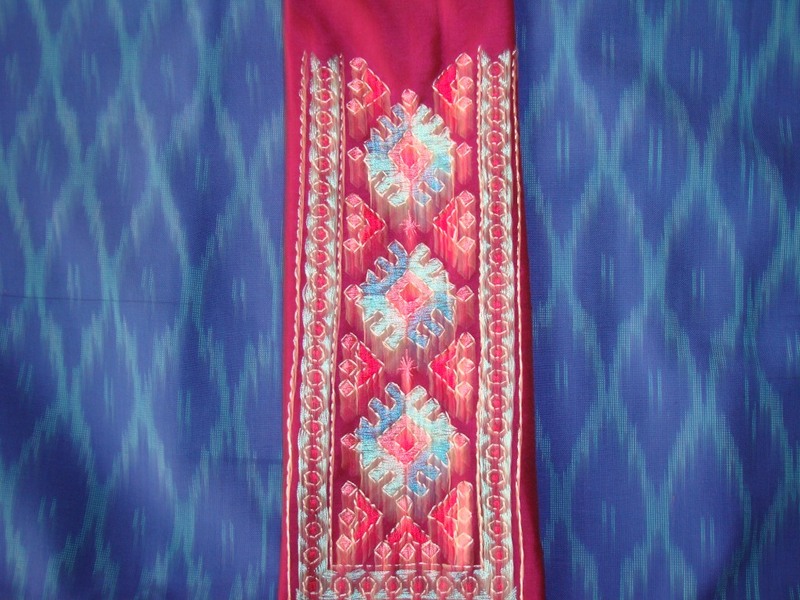 The working of this ethnic pattern will be continued on my next post.